Click to download The Big 5 Protection Pack is an advanced treatment for dogs. It protects your dog in and out. The bundle pack protects against a wide range of external as well as internal parasites. The oral treatment controls heartworms, fleas, paralysis ticks, and intestinal worms including tapeworms in dogs. 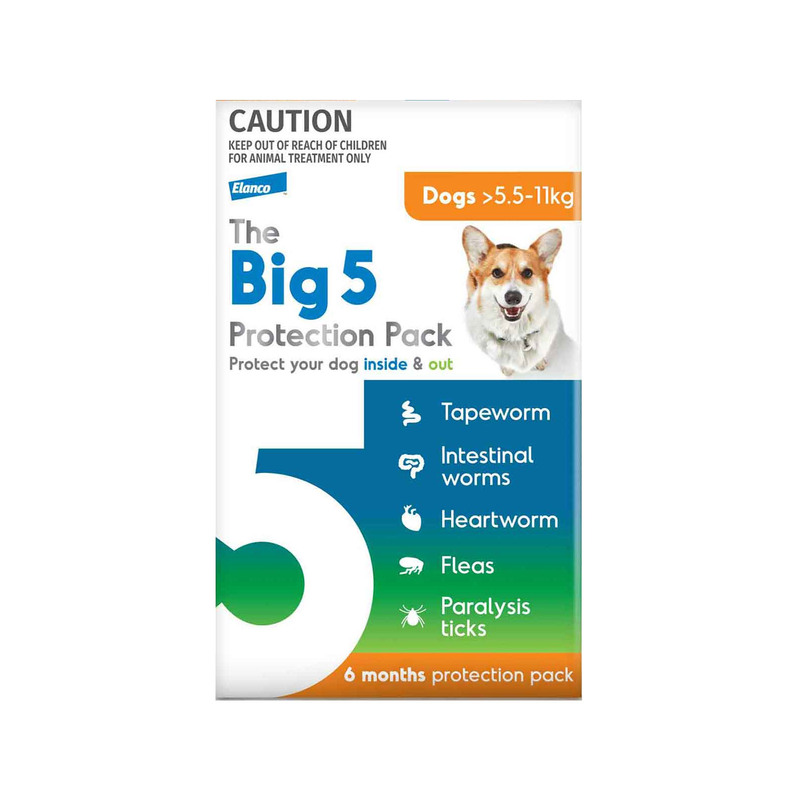 Monthly dose safeguards your dogs against various types of parasites. It is safe for dogs and puppies above 8 weeks of age. The Big 5 Protection pack consists of Interceptor Spectrum chews and Credelio tablets. When given monthly, both products work against a wide range of parasites. It is easy to administer and safe for all dog sizes. Interceptor spectrum is a tasty chew that controls heartworm disease as well as intestinal worm infections. The oral treatment treats immature stages of heartworms and eliminates intestinal worms. The oral treatment treats immature stages of heartworms and eliminates intestinal worms like roundworms, whipworms, hookworms and tapeworms. The monthly treatment protects dogs against recurring intestinal worm infections as well as heartworm disease. The real chicken flavoured chew is highly palatable and readily accepted by dogs and puppies. It is safe for use in puppies above 2 weeks of age. Credelio is an effective oral flea and tick treatment. The oral tablet is indicated for the treatment of flea and tick infestations. It eliminates fleas before they lay eggs. Credelio breaks flea life cycle and prevents future infestations. It also supports in the treatment management of flea allergy dermatitis. The oral treatment also treats ticks including paralysis ticks and protects dogs against the risk of Lyme disease. One dose controls the infestation for complete one month. annd it is easy to administer due to its beef flavour. Interceptor Spectrum contains two active ingredients – Milbemycin Oxime and Praziquantel. The active ingredient Milbemycin Oxime eliminates the immature form of heartworms(microfilaria) and thus prevents heartworm infection in dogs. It also treats intestinal worms including hookworms, roundworms and whipworm. The chemical acts on the nervous system of the worms leading to paralysis of the parasites, eventually eliminating them. The other ingredient Praziquantel is highly effective against tapeworms. The combined effect of the two key ingredients protects dogs against heartworms as well as intestinal worms including hookworms, roundworms, tapeworms and whipworms. Credelio contains the active ingredient Lotilaner, which is an ectoparasiticide. Lotilaner inhibits GABA gated chloride channels. This results in uncontrolled neurovascular activity leading to the death of parasites. It starts killing fleas within 2 hours and eliminates complete flea population within 12 hours. The oral tablet controls flea infestations for 35 days. It eliminates ticks within 48 hours and controls the infestation for complete 30 days. Institute it directly into the mouth or mix it with food. Should be given once a month. Administer it with food or after meals. Note: Read the enclosed Interceptor Spectrum and Credelio pack inserts for full instructions. Prior to treatment, dogs should be tested for existing heartworm infections. Do not use in puppies less than 8 weeks of age. For Interceptor Spectrum: Do not use in case the pet is allergic to the active ingredient. For Credelio: Use with caution in dogs with a history of seizures, muscle tremor and ataxia. For Interceptor Spectrum: There are no known contraindications for the use of Interceptor Spectrum. For Credelio: There are no known contraindications for the use of CREDELIO. My dog used to get recurring infections of intestines but ever since I have started feeding him Big 5, he hardly gets any. An amazing pack that is a great heartworm protector. It does really well to keep heartworm away.